“Email is dead.” This notion that email was on the way out has been around since we did the first E-Expectations study years ago. The conventional wisdom has been that, as teenagers embraced text messaging and social media, they would leave email behind. The reality is quite different, however. The E-Expectations project has charted email use and preferences among college-bound high school students for years, and while there is a slight reduction in email usage, it is still frequently used by the vast majority of students. 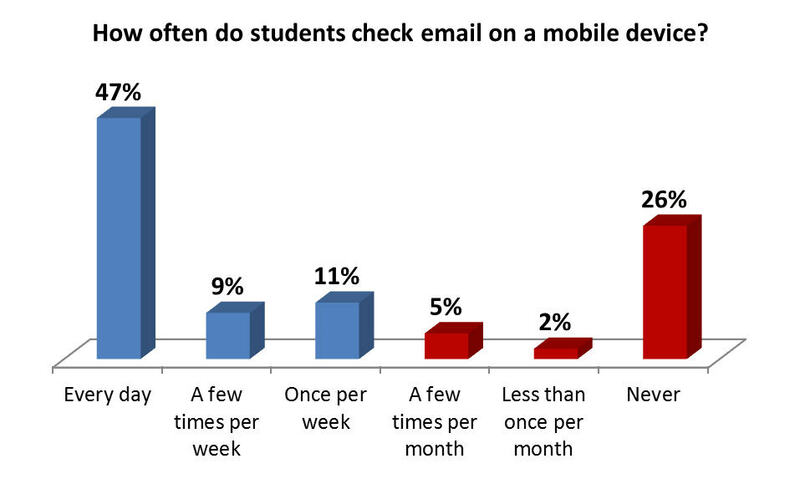 Okay, so students say they use email. But how likely are they to actually open recruitment emails? Once again, the data show a very high willingness to open emails received from campuses, even from institutions that students do not know. 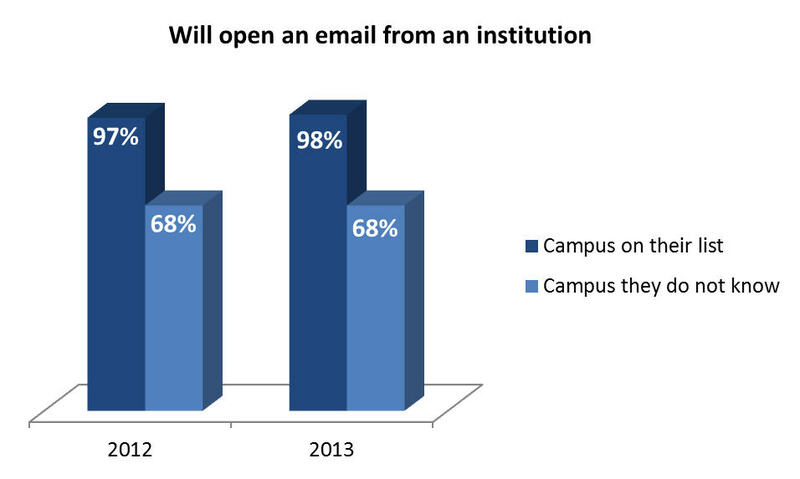 75 percent of students said they were interested in sending an email to a campus. 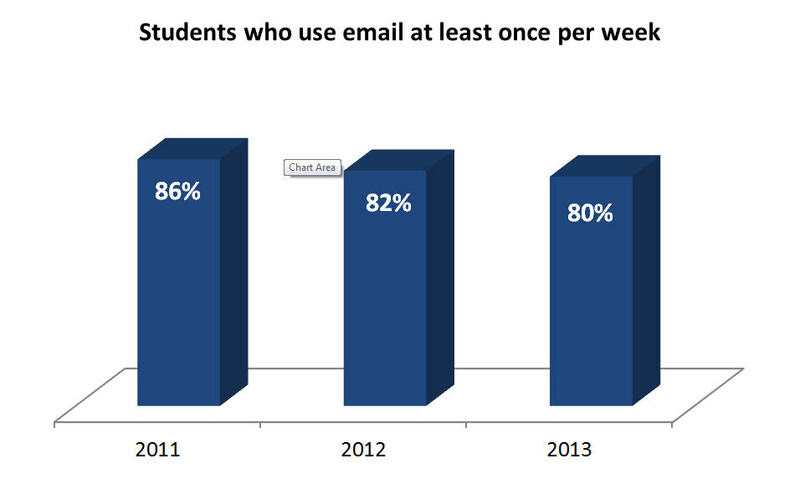 Students cited email as the second-most-influential resource after campus websites. That’s two-thirds who are checking email via mobile at least once per week, and more than half who are checking their inboxes at least a few times a week if not on daily basis. For years, open rate (the percentage of recipients who open an email) has been a touted metric in email marketing success. It’s not a terribly accurate measure, however, as it doesn’t tell you whether you engaged your readers. Click-through-rate (the percentage of those who opened and then clicked on a link) is a much better measure, as the click is the ultimate goal of any email. However, an email can still be successful even if the recipient doesn’t follow the links. Campus marketing usually requires a lot of contacts to get response, and an email may build campus awareness and interest even if that specific communication does not spur action. Thankfully, we have new analytic tools at our disposal that can give us much better insight on email reading. New engagement metrics can suggest if someone read an email, skimmed it, or glanced at it. These metrics are based on the amount of time the email is open. They are not foolproof—no metrics are—but they give us a much clearer picture of email engagement then we have ever had before. If you are not using metrics like these, I strongly urge you to investigate them. In all this talk about whether students will open and read email, it’s easy to forget that the point of email is to get them to a landing page. Students should be taken to a page that relates to the email they received and, from that page, have a way to connect with your campus (a form, phone number, incentive to make contact, etc.). Take a look at Michael Lofstead’s strategies for landing pages if you haven’t already, and remember, your home page is not a landing page. Adaptive displays are becoming more important for landing page layout, too. Imagine a student reading an email that adapts to their mobile display. The student follows the link (success!) only to land on a page with an inquiry form that doesn’t work on a mobile device. Put yourself in their shoes and imagine how frustrated you would be. Make sure those pages work on any and all platforms that could be used by students. It’s clear that, along with websites, email will remain a pillar for campus e-recruitment programs in the foreseeable future. There are many other communication methods that can be very fruitful as well—we’ve written about texting and live conversation opportunities before. Just be sure that you make a sound, strategic email flow a major part of your recruitment efforts. I encourage you to read the 2013 E-Expectations Report for more insights into email, mobile browsing, social media, and other online habits of college-bound teens. We also offer an on-campus Digital Marketing Analysis that includes an email analysis. And of course I am happy to answer any questions you have. Please feel free to send me an email or leave a comment below.